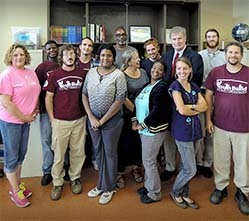 Instructor Tony Belak (back row, second from right) and the staff at YouthBuild Louisville following completing of the Compassionate Professional Trust Leader Training. Compassionate Organizational Trust Leaders are employees trained to deal informally with conflict within organizations. They are an informal staff resource — usually elected by fellow employees — to help prevent and manage conflict. They can constitute a manager’s “kitchen cabinet” on employee concerns, challenges, and insights. Compassionate Professional Trust Leaders are professionals trained to provide informal conflict prevention and management services to their clients. Examples of professionals to whom this training is directed are educators, social service representatives, and counselors. We have completed training for YouthBuild — Louisville, an education, job training and leadership program that provides low-income young adults ages 16-24 opportunities to realize their potential as active community leaders and an educated workforce for Louisville. This is a demonstration program for the roll-out of a larger program. Compassionate Community Trust Leaders are community members trained to serve as a trusted informal resource providing education, information, and assistance to prevent and respond to community conflict. Training has been provided in the Louisville community and at the Department of Urban and Public Affairs at the University of Louisville. Representatives from a broad range of organizations (e.g., the Office of the Mayor, New Directions Housing Corporation, Housing Partnership, Inc., and the South Central Neighborhood Association) were represented at the trainings. The most recent tabulated evaluations achieved an overall rating of 4.8 out of 5 (Excellent).